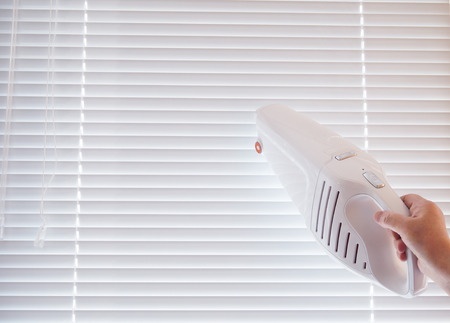 Dust, vacuum, or blow dry window blinds regularly, especially along the floor. If you have pets, use a pet brush to remove pet hair from blind slats. Clean vinyl blinds with a damp cloth. Don't wash or dry-clean fabric vertical blinds. Clean vinyl or aluminum vertical blinds with a damp cloth. Leave a light film of detergent on the vanes to reduce static electricity. To clean wooden painted blinds, tilt the louvers almost all the way up, and wipe them with a cloth moistened in a mild detergent solution, such as a few squirts of hand-dishwashing liquid in warm water. Clean as far into the eyelet holes as possible at the end of each row of mini blinds. Don't scrub too energetically, however: You may end up removing more than just the grunge. You might also remove the surface design or color. Then tilt them almost all the way down, and wipe again. This ensures that you clean the middle, too. Don't get stained wooden blinds wet, because water could damage the finish. Probably the most efficient way to wash vinyl or metal miniiblinds is ye olde traditional method of taking them down and immersing them in a bathtub full of soapy water. Rinse them, and then hang them over the shower rod to dry. Finally, you should know that some window shades, valances, and curtains are washable, especially if they aren't lined. Before washing, examine for sun rotting. If they have rotted, don't bother washing them. Just replace them. If they're not washable, you'll have to have them professionally cleaned.